Empire State of Mind tells the story behind Jay-Z's rise to the top as told by the people who lived it with him- from classmates at Brooklyn's George Westinghouse High School; to the childhood friend who got him into the drug trade; to the DJ who convinced him to stop dealing and focus on music. 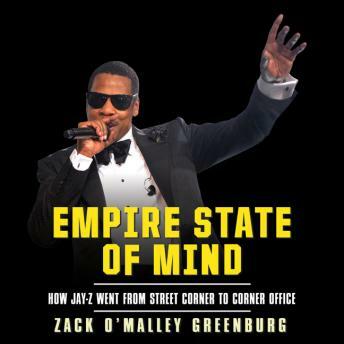 This audio book explains just how Jay-Z propelled himself from the bleak streets of Brooklyn to the heights of the business world. Zack O'Malley Greenburg draws on his one-on-one interviews with hip-hop luminaries such as DJ Clark Kent, Questlove of The Roots, Damon Dash, Fred 'Fab 5 Freddy' Brathwaite, MC Serch; NBA stars Jamal Crawford and Sebastian Telfair; and recording industry executives including Craig Kallman, CEO of Atlantic Records.